My Experience With Cooking: Kerala Kadala Curry-With Roasted Coconut & Aromatic Spices! You are here: Home > Vegetarian > Kerala Kadala Curry-With Roasted Coconut & Aromatic Spices! Kerala Kadala Curry-With Roasted Coconut & Aromatic Spices! Puttu(steamed rice cakes)-Kadala(Chick peas/Channa) curry forms one of the traditional breakfast dishes of Kerala cuisine and one of my favourites. In fact this is one of the speciality dishes of the cuisine and it has become so important that whenever I'm reminded of my homeland-Kerala, Puttu-Kadala comes to my mind! This is a common breakfast item in thattukadas(small roadside tea-shops). The recipe which I have mentioned below is Kerala style kadala curry. Black chickpeas which have a rough outer skin are used in this preparation. There are two varieties of chickpeas- one that is lighter in colour, larger in size with a smooth outer skin and the other black in colour, smaller in size with a rough skin. Chickpeas is a good source of protein, folate and is very high in dietary fibre. Fat content is low and is a good source of calcium. Its even said that chickpeas has calcium content close to milk and yoghurt! Black chickpeas need to be soaked in water for eight hours before cooking. The cooked chickpeas are then added to a tomato based gravy(sauce) prepared with sauteed browned onions, aromatic spices and roasted coconut. The combination of spices and roasted coconut imparts a unique flavour to this dish. Soak the raw chickpeas in enough water for eight hours prior to cooking. Cook the soaked chickpeas along with the water used for soaking, enough salt and more water in a pressure cooker till done. In the cooking method I followed, after the first whistle, heat was reduced to low and cooked for additional 20-24 minutes. In a pan dry roast the grated coconut at low flame for few minutes. When it starts to change colour add the sliced shallots and continue roasting till the coconut turns dark brown. This whole process may take about 25 minutes and the important point to be noted is that the heat should always be kept at low. Never hasten the process of roasting by increasing the heat, otherwise you wouldn't get the true flavour of roasted coconut. Cool and grind without adding water. The oil in the roasted coconut aids in grinding and water shouldn't be added. Keep aside. In the same pan dry roast the ingredients mentioned above at medium heat till the colour slightly changes and you get the aroma of freshly roasted spices. Cool and grind to a fine powder. Keep aside. Heat 1.5 tsp of coconut oil in a pan and splutter mustard seeds. Add curry leaves and saute till it turns crisp. Do not allow the colour to change. Add chopped onions and saute till it turns brown. Add chopped tomatoes and cook till it turns mushy. Add the ground roasted spices along with chilly powder, turmeric powder, coriander powder, chole masala and enough salt. Saute till raw smell of spices go. Add water used for cooking chickpeas along with ground coconut mixture. You may also need to add additional water. Bring to a boil. Add the cooked chickpeas and cook at low heat till the gravy(sauce) turns thick enough. Turn off heat and serve hot with Puttu. 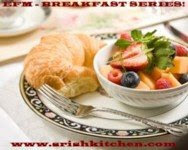 This goes to EFM June- Breakfast Series hosted by SriLekha of Me and My Kitchen. Thanks Parita :) Yes goes well with rice too! Need a favour from u.. can u see my updates in ur reading list.. I did post something today..i think i aslo have the issue which u blogged before..please reply..
thanks for spedy reply pooja... lemme wait and see.. Thanks Padma :) Do try whenever you get a chance. Its very simple and easy. Puttu and kadala curry is perfect combo. Love it. Looks delicious. I absolutely love this with puttu! The other two things that I love with puttu are bannanas+sugar and spicy mutton curry. I've only eaten puttu at my friend's place in Kerala-can it be made without the puttu steamer? Thanks Vrinda :) Ithu evide kandalum enikkum kothi varum! Thanks Valar :) Yes it is indeed! Thanks Sweta :) You are right..those are great combos too. For making this you do need the funnel shaped vessel or chiratta puttu shaped vessel in which you keep the puttu flour but u may make it without the steamer that forms the lower section. Instead you may keep the vessel containing puttu on top of a pressure cooker and steam it. Wat an authentic dish...Kadala curry makes me hungry!!! hi pooja thanks for following it.. i have changed my feeds to feedburner..not sure why my picture are showing in that post..u have any idea? Oh that should make it better Ashwini! Sorry I dont have an idea why your picture is not showing in Reader. Will let you know if I come to know abt it. The curry looks really good with the aromatic spices! would it be wrong if I just pulled up a chair and ate straight from the main dish....this looks so good! Hey DB, not a prob at all! You are most welcome! I have tried Puttu only once and I loved it...never got chance to try again...I think it is not available in north and even tried finding it in B'lore...but both Puttu and curry are looking wonderful and tempting.. Thanks Preethi :) Yes it is hard to find Puttu outside Kerala but some mallu shops outside the state do serve Puttu. Its very easy to make. Stay tuned for the recipe! Thanks Hari Chandana :) Welcome to the blogging world! Hey Lena I'm doing good. Thank you :) Hope you are doing great too. Puttu and kadala nice combo...My favorite breakfast in my college hostel days..
this sounds super delicious.. great with puttu. What a delicious gravy it looks so so good! I wish I had a huge spoon to scoop some up in yum yum. Kadalai curry with puttu... delicious combo. I can have it any time. Nice pics. Pooja i am following u but i am not getting the updates from u , just saw it today u have 2 updates.. will check tomm again. by the way i love this curry looking so good and tempting. Thanks Pavithra :) Saw your latest comment. Hope you dont have prob in viewing updates now. I can never say no to this authentic dish just love it...u've got me drooling. Kala chana is my personal fav. Thanks Suparna :) Mine too!